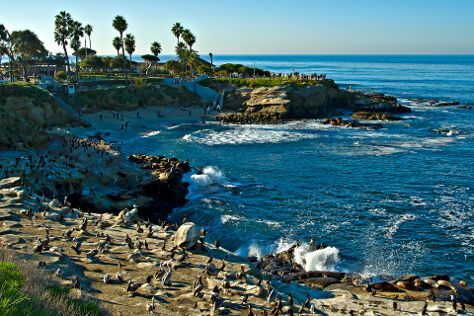 Bring the kids along to La Jolla Cove and San Diego Zoo. Get in touch with nature at Dolphin & Whale Watching and Point Loma. Explore San Diego's surroundings by going to Oceanside (Oceanside Pier & Oceanside Museum of Art) and South Carlsbad State Beach (in Carlsbad). Next up on the itinerary: admire the majestic nature at Torrey Pines State Natural Reserve, pause for some photo ops at Mt. Soledad National Veterans Memorial, pause for some serene contemplation at Our Lady of the Rosary Church, and explore the different monuments and memorials at Fort Rosecrans Cemetery. For maps, other places to visit, where to stay, and other tourist information, you can read our San Diego trip builder . Lancaster to San Diego is an approximately 9-hour flight. You can also do a combination of train and flight; or drive. Due to the time zone difference, you'll gain 3 hours traveling from Lancaster to San Diego. Traveling from Lancaster in June, you will find days in San Diego are a bit cooler (73°F), and nights are about the same (64°F). Cap off your sightseeing on the 6th (Thu) early enough to travel to Grand Canyon National Park. You'll explore the less-touristy side of things at Rim Trail and Mather Point. Get some historical perspective at Hermit's Rest and Grand Canyon Railway Depot. On the 8th (Sat), hike the day away at Bright Angel Trail. 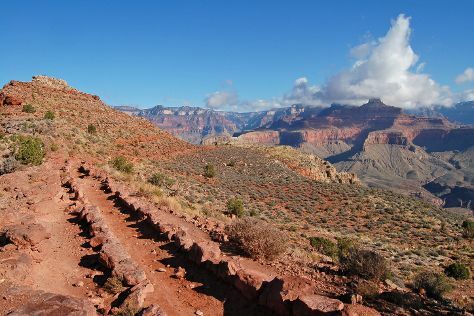 And it doesn't end there: stroll through South Kaibab Trail, take in breathtaking views at Yavapai Point, trek along North Kaibab Trail, and get great views at Grandview Point. To find maps, ratings, where to stay, and tourist information, refer to the Grand Canyon National Park online driving holiday planner . You can do a combination of flight and bus from San Diego to Grand Canyon National Park in 8 hours. Alternatively, you can drive; or do a combination of flight and shuttle. The time zone difference when traveling from San Diego to Grand Canyon National Park is 1 hour. While traveling from San Diego, expect somewhat warmer days and much colder nights in Grand Canyon National Park, ranging from highs of 85°F to lows of 42°F. Finish up your sightseeing early on the 12th (Wed) so you can go by car to Monument Valley. Monument Valley is a region of the Colorado Plateau characterized by a cluster of vast sandstone buttes, the largest reaching 1000ft above the valley floor. Get a sense of the local culture at Bluff Fort Historic Site and Goulding’s Trading Post Museum.. Get some historical perspective at Monument Valley Navajo Tribal Park and Navajo National Monument. Explore Monument Valley's surroundings by going to Blanding (Natural Bridges National Monument & Goosenecks State Park) and Canyon de Chelly National Monument (in Chinle). The adventure continues: take in the dramatic natural features at Monument Valley Navajo Tribal Park. To see more things to do, maps, where to stay, and more tourist information, refer to the Monument Valley online tour itinerary planner . Traveling by car from Grand Canyon National Park to Monument Valley takes 3.5 hours. Traveling from Grand Canyon National Park in June, you can expect nighttime temperatures to be somewhat warmer in Monument Valley, with lows of 54°F. Wrap up your sightseeing on the 16th (Sun) to allow time to travel to Yosemite National Park. Kids will enjoy Mono Lake County Park and Cathedral Beach Picnic Area. Get a sense of the local culture at Bodie State Historic Park and Mono County Museum. Spend the 20th (Thu) exploring nature at Bridalveil Fall. 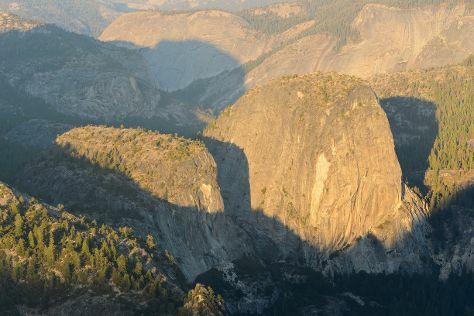 There's much more to do: take in the dramatic scenery at Vernal Fall, hike along Panorama Trail, explore the striking landscape at Glacier Point, and tour the pleasant surroundings at Nevada Falls Loop. To find reviews, more things to do, where to stay, and other tourist information, use the Yosemite National Park trip itinerary maker site . You can do a combination of car and flight from Monument Valley to Yosemite National Park in 9 hours. The time zone changes from Mountain Standard Time (MST) to Pacific Standard Time (PST), which is usually a -1 hour difference. Plan for slightly colder temperatures traveling from Monument Valley in June, with highs in Yosemite National Park at 79°F and lows at 43°F. Wrap up your sightseeing on the 22nd (Sat) to allow time to travel to Yellowstone National Park. Kids will enjoy Firehole Canyon Drive and Grand Teton. Discover out-of-the-way places like Grand Loop Road and Grand Prismatic Spring. Spend the 26th (Wed) exploring nature at Yellowstone National Park. There's lots more to do: take in breathtaking views at Grand Canyon of the Yellowstone, identify plant and animal life at Hayden Valley, contemplate the waterfront views at Lake Butte Overlook, and admire all the interesting features of S Rim Trail. For ratings, where to stay, and other tourist information, go to the Yellowstone National Park online road trip planner . Traveling by combination of car and flight from Yosemite National Park to Yellowstone National Park takes 10 hours. Alternatively, you can do a combination of bus, flight, and car. Traveling from Yosemite National Park to Yellowstone National Park, you'll lose 1 hour due to the time zone difference. Traveling from Yosemite National Park in June, things will get a bit cooler in Yellowstone National Park: highs are around 66°F and lows about 34°F. On the 30th (Sun), wrap the sightseeing up by early afternoon so you can travel back home.